There's been much *buzz* surrounding bees lately...see what I did there with that slightly overused pun? ;) But seriously bees have been in the news a lot recently, and not for reasons we would like to see. One particular species, the Rusty Patched Bumble Bee (Bombus affinis), one of nearly 50 species of bumble bee found in North America, has made the endangered species list. 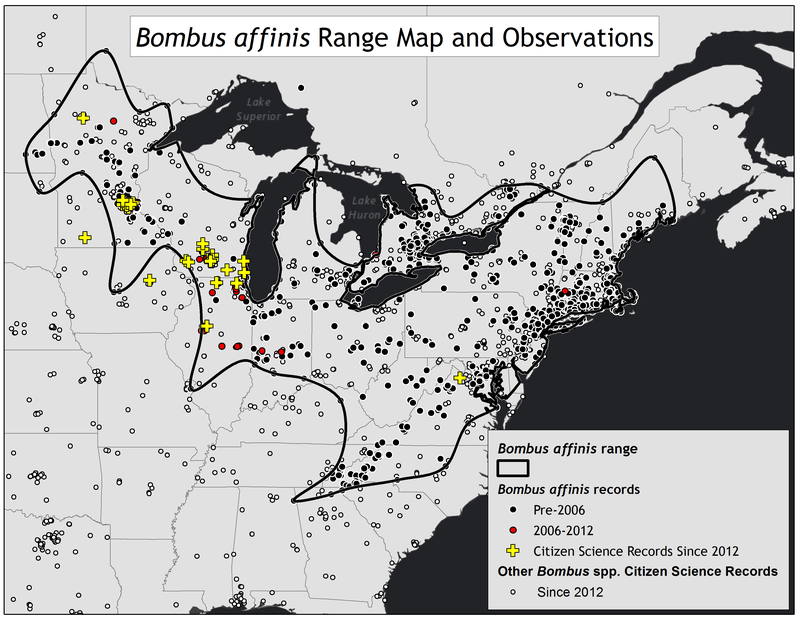 This little guy is native to Eastern North America (see map to right), including Michigan, yet its population and range have declined drastically in recent years. 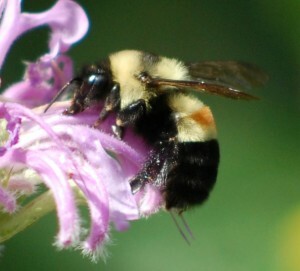 While the exact cause of the drastic decline has not been entirely understood, factors that have likely contributed to the decline include pathogens that have been amplified by commercial bees (specifically Nosema bombi; a pathogen that wild bees have little resistance to), habitat loss, pesticide use, and climate change. Did you know that pollinators, such as the Rusty Patched Bumble Bee, are responsible for every 1 out of 3 bites of food we take each day? That's a big number, considering pollinators are at a critical point in their own survival. The U.S Fish & Wildlife Services estimates that nearly 75% of the earth's flowering plants depend upon pollinators in order for the plant to set seed or fruit, like blueberries, tomatoes, apples...most of your fruits & veggies. Some pollinators even manage pests like aphids, other insects are also very helpful in managing pests...like the Eastern Giant Ichneumon Wasp. Native Plants- Increasing the number of pollinator friendly gardens & landscapes will help revive the health of bees, butterflies, birds, bats & other pollinators nationwide. 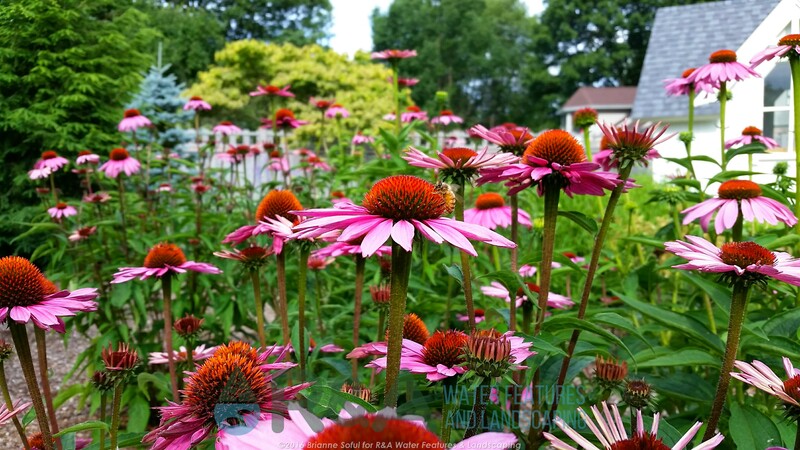 Learn more about native plants here, why they are important, and some of our favorite native trees, shrubs, and perennials for your Michigan landscape. Pesticides- Just say no. Pesticides are harmful to pollinators, especially insecticides...and herbicides are just as bad. They reduce the available food sources for pollinators by removing flowers from the landscape. If you absolutely must get rid of pests & noxious weeds...contact a professional or try a natural remedy. I've heard of solutions using baking soda, soap, cooking oil, many different items really, with varying success. Homes You don't need to be a fancy bee keeper to provide a home for growing pollinators. Patches of bare ground can host as a 'nesting area' to ground nesting bees. Plants can serve as host to certain caterpillars, shrubs & trees can provide shelter for birds, and bat houses provide a safe, warm place for females to raise their young. Share The Message & Take Action Make a promise and sign the Pollinator Protection Pledge, here, with The Xerces Society for Invertebrate Conservation. You can also register your pollinator garden, here, for the Million Pollinator Garden Challenge, through the National Pollinator Garden Network. Lastly be sure to share & spread the bee message on Facebook, Twitter, and any other social media platform you may use! When you're ready to start your pollinator friendly garden, you can be assured we will design a landscape that will include a minimum of 60% native plants. Most landscapes we have completed have been much higher, some 100% native. Below is a quick, bee friendly, cheat sheet for your landscape from our friends at Part Select.